Council of Conservative Citizens informed Dylann Roof is tax exempt 501c4. 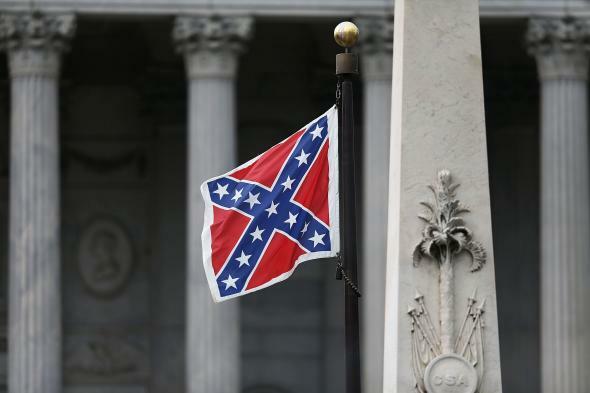 The Confederate flag flies on the Capitol grounds on June 22, 2015. The group that “informed” Dylann Roof’s deeply racist beliefs, and writings, is the Council of Conservative Citizens (CCC). Roof even cited the group’s website when talking about his arrival at a white supremacist viewpoint. In the aftermath of the shooting, after some digging found the group’s leader, Earl Holt III, contributed to a handful of GOP Presidential hopefuls, the candidates quickly distanced themselves from the group the Southern Poverty Law Center called a “modern reincarnation” of a network of white supremacist groups that fought against desegregation in the 1950s. The CCC, which decries “race mixing,” doesn’t even remotely approach acceptable or even mainstream American thought on race. Even so, as the Center for Public Integrity reported on Tuesday, the Council of Conservative Citizens is listed as a “nonprofit organization that promotes social welfare, also known as a 501(c)(4)” and therefore pays no federal taxes—making the hate group essentially subsidized by American taxpayers. Tax-exempt social welfare groups are supposed to “primarily promote the common good and general welfare of the people of the community as a whole,” according to IRS documents. Groups that espouse hate can be stripped of their tax-exempt status, said Marcus Owens, who ran the IRS’s exempt organizations division in the 1990s. That happened to the neo-Nazi group National Alliance in 1982… However, Owens says Republicans in Congress have made it virtually impossible for the IRS to revoke the tax-exempt status of political groups after the recent, so-called Tea Party scandal. Republicans criticized the IRS for what they said was inexcusable targeting of conservative 501(c)(4)s.
The CCC has been tax exempt for 20 years and in its most recent tax filing reported revenues of just $67,000, another potential reason the IRS hasn’t pursued revoking the group’s tax-exempt status. A spokesman for the CCC, looking to deflect responsibility for Roof’s murderous rampage, said it was “a big mistake” to say the group’s racist beliefs “inspired” Roof—rather, they “informed” him.